Approximate locations of the burglaries listed by police. Burglars are breaking into garages on the North Side “almost exclusively” to steal bicycles, according to a new community alert from Chicago police. 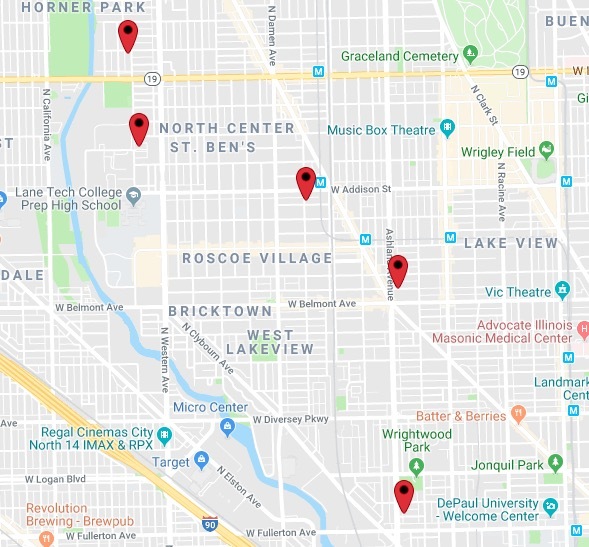 In the warning, police said the break-ins have been happening during overnight hours in North Center, Lakeview, and Lincoln Park since July 22nd. Some of the garages were left unlocked, but others were entered by “unknown means,” police said. Community alerts are typically issued when investigators believe that a series of crimes is the work of the same individual or group. Anyone with information about the burglaries can contact Area North detectives at (312) 744-8263.